Welcome to the Happy Holidays 2015 Giveaway Event! Wishing you all Happy Holidays 2015! To make you happy for the holiday season, we are gift giving prize packages worth over $3,000 to 7 lucky winners! This event is hosted by Dixieland Reviews and co-hosted by: Imperfect Women, Finger Click Saver,Joyful Gifts by Julie, Mom n’ Daughter Savings and Mom to Grandma. This event is sponsored by Vivitar, We Love Travel Deals and NuVending and partially sponsored by fees collected from the participating bloggers for this event! 1 lucky winner: For the adventurous one on your list, the affordable Vivitar DVR786 action camera! arv: $60 Read about it here. 1 lucky winner: Nunet™ Nucharger Multi-function Auto Set for everyone on your list! arv: $90 Read about it here. 4 lucky winners: Each winner will receive a $500 Visa Gift Card. Grand Prize: 1 winner will receive a $1,000 Visa Gift Card. This giveaway is open to residents of the US and Canada, void where prohibited by law. Winners will be announced on our winners page once they’ve responded to the email notification. The participating bloggers are not responsible for the shipment of prizes. All prizes will be sent from Sponsors. All winning entries will be verified, if the task associated with the winning entry was not completed, you will be disqualified. Please direct any questions to [email protected]. This event begins November 24th, 2015 at 1:00 pm Eastern Standard Time and ends on December 5th, 2015 at 11:59 pm Eastern Standard Time. Disclaimer: Work Money Fun is not responsible for prize fulfillment. 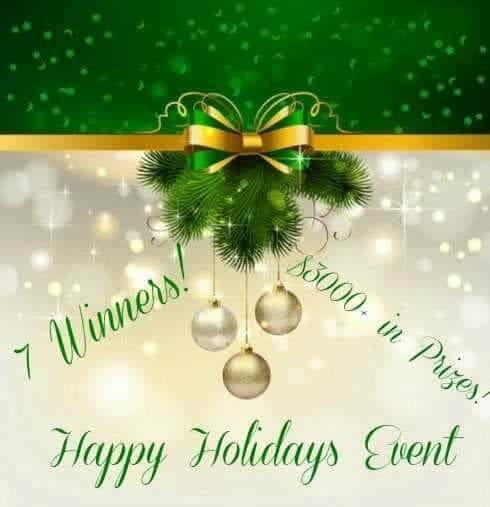 Sponsors will ship all the prizes to the winners of Happy Holidays 2015 giveaway. The number one gift on my list is something extra-nice for my cat who has had a difficult year with vet visits and health issues. A gift card or Visa loaded with $1000 is tops on my list for sure. Oooh…those prepaid Visa Cards are calling my name! I would like some adult colouring books for my mom. She loves colouring and finds it very soothing. Number one on my wish list this year is that my son have a magical Christmas. Probably a gift card for each of my 5 nephews. I would like s gift card so I can buy what I need that would be awesome ?? I would like to have a healthy and happy Christmas for all those that I love. I would really like a new laptop, as mine is on its last leg. Definitely want an upgrade for my computer or a new laptop! I love giving gifts more than getting one. I would like to get a really nice ipad for my husband. The money would be most welcome as I am moving to Ecuador and, with 5 (yes, 5) dogs and the expense is might big and the logistics is mighty complicated. My first smart phone is on my list. Number one on my wishlist this year is new Asian beauty products to try! Tops on my list is always money or gift cards. I’d love a new vacuum for Christmas! At the top of my wish list is a Mega Winning Lottery ticket. I would like a salt lamp. Hubby and I bought our gift already and it will be here next Friday. We got ourselves a treadmill! I would love to win an ipad for my husband. I would love a new big screen 4K TV! My #1 gift that I would love to receive is a Samsung Galaxy Tab 10.1 Tablet!!! I want to get a table for my daughter in law so she can play games.